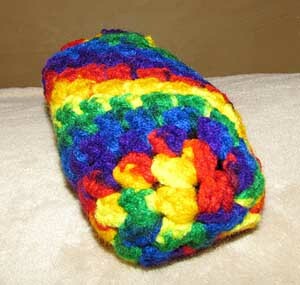 Magic Rainbow Slippers Save the Day! For those who are lucky enough to be living in an area that has not been bombed with snow for the past month, let me enlighten you on what happens after the twice a week snowstorms. On the random days when it has the nerve to go above freezing and even rarer occasions when it actually rains, you need to carry a raft to get across the street. After one such day when my socks and sneakers were wet at work the entire day (and I was cold and miserable), I knew there had to be a better way. One of my UFOs came out of hiding, was finished very quickly, and found a permanent place in my purse. They were my Magic Rainbow Slippers. The next time when my feet got soaked on the walk across the street from where I parked to my job, I simply took off my socks and sneakers, placed them in front of a heater (since our office is basically unheated), and slipped on my Magic Rainbow Slippers. I swear they have magic powers because I felt wonderful! I wore them all day and when it was time to go home, my socks and sneakers were dry. Sometimes, a little magic goes a long way. P.S. 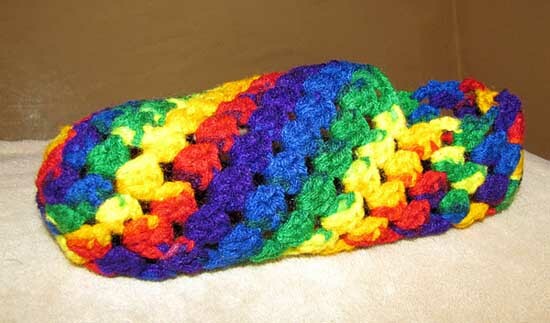 This is a favorite slipper pattern of mine and you can buy it on Etsy from The Royal Sisters.